18 January 2007, Initial revision. For the impatient: pop your SIM into a UMTS 2100 handset and you're good to go. Note: while this article is geared toward a U.S. audience, it is certainly applicable to anyone with a GSM account that can roam internationally. Additionally, please keep in mind that wireless technology changes fairly rapidly, and portions of this article will inevitably become inaccurate over time. Back in 1999, when the book was published, Stephenson had things backwards: GSM was nowhere to be found in Japan, while fledgling PCS carriers in the U.S. had been offering the service for a couple of years. For the longest time, Japan was a sort of island in the global wireless phone landscape, utilizing custom protocol variants and different frequencies. Some roaming was possible with certain carriers, but it was cumbersome and typically required a special handset. These days, however, the story is different. Seamless roaming in Japan is now quite easy with a modern 3G GSM cellular phone. It's certainly not without its pitfalls and is by no means cheap, but the convenience of having both a working phone and your home number while traveling in Japan is undeniable. First, a little background on the world of wireless should help to clarify (confuse?) the present situation. In the United States, there are now two primary wireless phone standards: GSM and QUALCOMM's CDMA. Of the major national carriers, Sprint and Verizon have CDMA networks and T-Mobile and Cingular (soon to be AT&T) have GSM networks. While limited roaming in Japan is possible through Verizon and Sprint, they still require special handsets. This article really only addresses Cingular and T-Mobile customers on a native GSM network. The Global System for Mobile Communications, or GSM, standard was introduced in Europe during the late 80's and early 90's and quickly became the most popular standard worldwide. It is a second-generation, or 2G, digital standard based on TDMA. (Sprint actually built one of the first GSM networks in the U.S., but later decided on the CDMA standard for their nationwide network.) One of the key components of GSM is its Subscriber Identity Module, or SIM card. Every GSM phone has one of these “smart cards” which can be removed and inserted into a different phone. Unlike with the older first-generation AMPS, original TDMA/D-AMPS networks, or with current U.S. CDMA networks, your phone account is not tied to the phone itself -- rather, the SIM card contains the necessary subscription info, making the handset easily interchangeable. Additionally, the SIM card may contain your phonebook and text messages, which a new handset can instantly recognize. 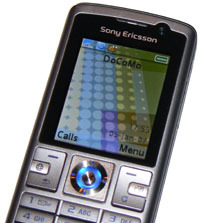 GSM 900 Most of the world except for the Americas (Brazil and Venezuela being exceptions), Japan, and South Korea. GSM 1800 Most of the world except for the Americas (Costa Rica and Uruguay being exceptions), Japan, and South Korea. GSM 1900 T-Mobile and Cingular in the U.S.; also Canada, Mexico, and much of South America and the Caribbean. For all practical purposes, a handset supporting GSM 1900 is sufficient in most of the U.S., but a GSM 850 phone will extend your coverage to less populated areas. When roaming outside of North and South America, you want a GSM 900/1800 handset. Of course, the ideal setup is a quad-band phone that covers all four frequencies. The Motorola RAZR V3, a quad-band GSM phone. So, our little table above covers pretty much the entire globe with the exception of Japan and South Korea. Well, for whatever the reason, they completely ignored the 2G GSM push, instead tending more toward CDMA technologies. Fortunately for us, however, these two countries also happen to be on the bleeding edge of wireless phone technology and have largely led the charge toward third-generation (3G) networks. Japan (NTT DoCoMo) developed W-CDMA as a successor to its 2G networks and submitted the technology for adoption as an international 3G standard. Note that W-CDMA is distinct from QUALCOMM's CDMA that Verizon and Sprint use. To make things even murkier, QUALCOMM's 3G variant is called CDMA2000. At any rate, W-CDMA has been adopted as the 3G standard for GSM networks and goes by the impressive-sounding Universal Mobile Telecommunications System, or UMTS. For good measure (since we don't have enough acronyms already), UMTS is sometimes also referred to as 3GSM or just 3G. Thus, W-CDMA is to UMTS/3GSM as TDMA is to GSM. For simplicity's sake, the “official” global frequency for UMTS is 2100 MHz, and most phones you find these days operate at this frequency. (If the UMTS frequency isn't specified, you can usually assume 2100.) Unfortunately, as with any other good protocol, a single frequency is not enough. In the U.S., much of the standard 2100 MHz allocation is already being used, so Cingular is rolling their UMTS network out on 850 and 1900 MHz, while T-Mobile has plans for a split 1700/2100 MHz implementation. So, you've got to be careful when buying a phone from T-Mobile or Cingular if you plan on roaming to a different network, and you have to be extra careful when buying a phone from a third-party vendor if you want to use it on T-Mobile or Cingular's networks. But, remember that you can always swap your SIM card among phones! Cingular GSM 850 and GSM 1900; UMTS 850 and UMTS 1900 if you're interested in high-speed data. So, where does this leave us? Back in the old days (a couple of years ago), most tri-band “world phones” supported GSM 900, GSM 1800, and GSM 1900. (GSM 850 is the relative newcomer to this collection of frequencies, and isn't as widely supported in handsets as the other three.) With these three frequencies, you can roam pretty much everywhere except the rural U.S., parts of South America, Japan, and Korea. As mentioned earlier, you can get quad-band phones that add GSM 850 and that work everywhere but Japan and Korea. I have T-Mobile (formerly VoiceStream Wireless, formerly Aerial Communications) as my carrier here in the U.S. Last fall, I decided it was finally time to upgrade my old but trusty Ericsson R520m and purchased a Sony Ericsson K610i from Mobilebee.com (search Froogle for more options). Aside from an aborted Sidekick experiment, as a general rule, I avoid purchasing phones from my carrier: the phones are locked to the carrier, which is a hassle; sometimes the phones are neutered; they've got all sorts of carrier branding; and their selection usually just isn't that good. The K610i is a nice little phone. It's fairly basic, with all the standard features you'd expect. It supports GSM 900, GSM 1800, GSM 1900, and UMTS 2100. It's also got Bluetooth and tethers very nicely to my laptop for slow-but-adequate data access in a pinch. The only thing it's lacking is GSM 850, which I needed when traveling to West Virginia for work. This slight problem was easily solved by slipping my SIM card into an unlocked Nokia 6030 (GSM 850 & GSM 1900) I had purchased off of Craigslist, complete with delivery by a guy on a skateboard. Finally, all of the above converged last month to result in 5 bars of signal and a novel little 3G icon displayed on my phone when I landed in the Tokyo Narita airport for vacation. After taking a couple of seconds to get its bearings, my K610i registered with NTT DoCoMo and subsequently delivered a couple of SMS messages I had missed while in the air. This contrasted sharply with the last time I had passed through Japan a couple of years ago when, as far as my phone was concerned, I may as well have been in Antarctica. My K610i registered with NTT DoCoMo in Tokyo. So, armed with a little knowledge about mobile networks and careful selection of both your wireless carrier and phone, you can now enjoy the convenience (and novelty) of a single phone number for voice and text messaging anywhere in the world! An excellent resource for international roaming is GSM World's coverage maps. You can select the country you're visiting and view carriers offering service, the protocol and frequencies they use, and a map showing coverage quality. 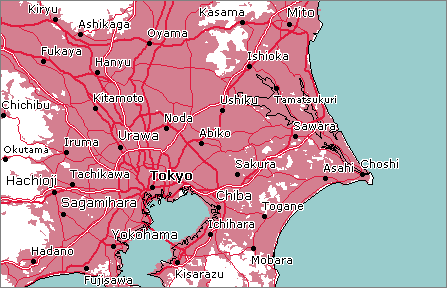 Coverage map of NTT DoCoMo's UMTS 2100 network in Tokyo. At publication, T-Mobile offers Japan roaming through their “WorldClass” rates at $1.99/minute. SMS messages are 35 cents apiece, while data services are 1.5 cents/KB. If you've been grandfathered into their old international roaming rates (which are no longer available to new customers), the rates are a bit more complex and vary by carrier. See T-Mobile for up-to-date information. Cingular World Traveler subscribers (which involves a monthly fee) can roam in Japan for $1.69/minute, while regular subscribers pay $2.29/minute. SMS messages are 50 cents apiece and data is 1.95 cents/KB. Contact Cingular for price updates and details. If you find any glaring errors, have new information you'd like to share, or just want to comment, please let me know!